During my high school and college studies, I have had the distinct privilege of singing in multiple choral ensembles. It was in chorus that I first encountered the unspeakable beauty to be found in music. Singing in ensemble I helped to create some of the most beautiful music I had ever heard. I then began to realize the power of beauty as well as its central role in the life of man. The beauty I heard in this music struck me to the core. It wounded my heart and awakened in me an eager desire. I wanted to find more of this beauty. I sought out more and more music that had this splendor, this magnificence. But after searching out and listening to so much music, I realized that no single musical work would satisfy this yearning. My desire was for Beauty itself. The most beautiful music elicits just this response: a deep gratitude for beauty and an insatiable desire for the fullness of Beauty. Our hearts yearn for the height of divine beauty. From early in his childhood, Dietrich von Hildebrand was inundated with beauty. He grew up in Florence, a veritable treasury of beauty in the form of paintings, sculpture, architecture, and music. It was on the basis of this personal experience that he was able to write extensively on the subject of beauty. He knew well this longing for beauty. In his essay "Beauty in the Light of the Redemption," he wrote of the upward surge of the heart in response to that which is beautiful. Concerning the beautiful work of art, he said "as we behold its beauty, our heart is filled with a desire for loftier regions about which this beauty speaks, and it looks upward with longing." (1) In the aesthetic experience, one is opened to a spiritual realm of the highest values. We long to participate in the fullness of beauty, truth, and goodness. In contact with the elevated spiritual values, man compares his own moral quality with the beauty of this realm. He realizes "the incompatibility of all that is base and morally bad with this world." (2) Man desires not only to observe and delight in beauty. He also yearns to commune in beauty. After one's heart has been pierced by the sweet light of beauty, one desires to reflect this splendor in one's way of life. By living a virtuous life, one radiates with a splendor of moral goodness. There is a beauty to Mother Teresa's humble way of love that surpasses even the greatest work of art. In experiencing the sublimity of the work of art or the nobility of Mother Teresa’s deeds, we yearn to embody beauty in our own lives. During this Christmas season especially, there is an abundance of beautiful art and music to appreciate. The beauty of these works of art draws us out of a mundane existence and awakens us to the depths of reality. We respond to the majesty before us with great awe. 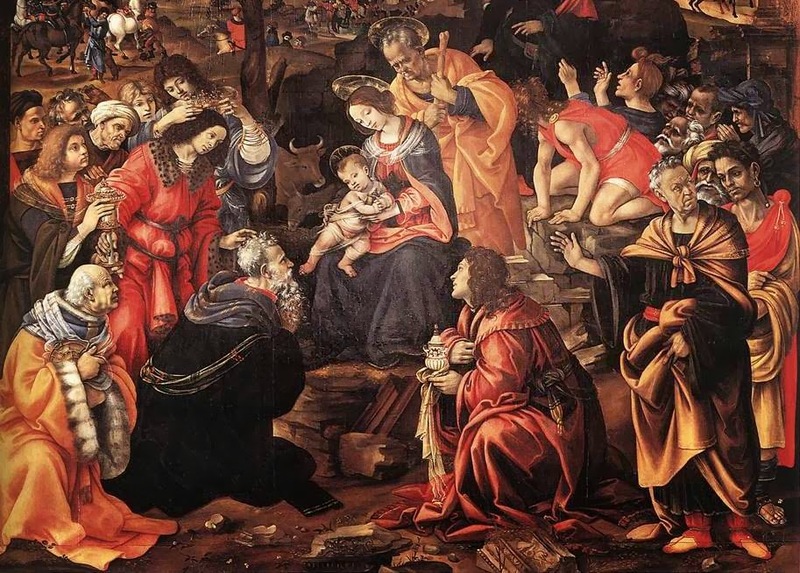 Through these works of art, the beauty of the Christmas message touches our heart in a new way. 1. Dietrich von Hildebrand, "Beauty in the Light of the Redemption" in Logos 4:2 Spring 2001, 88-89. 2. Ibid., 89. 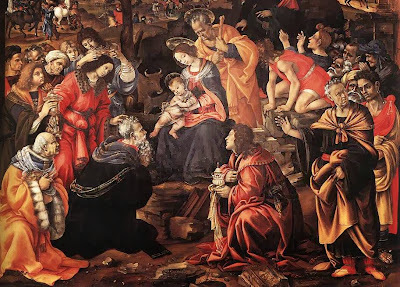 Artwork: Filippino Lippi, Adoration of the Magi, 1496, Uffizi Gallery, Florence. (source) Video: "O Magnum Mysterium." Composed by Morten Lauridsen in 1994. Artist: University of Utah Singers.